Dedicated to all Islanders, we are your partner for better health. Located on the Charlottetown waterfront, we are open 7 days a week to serve you better. Registration begins at 8:00 AM Monday through Saturday and one hour prior to the clinic start on Sunday. We will take registration for all clinics throughout the day beginning at 8:00 AM. Please be advised that walk-in clinic registration may close early once maximum capacity has been reached. A valid provincial health card is required for your visit or fees may apply. Valid out-of-province health cards are accepted with some exceptions, charges for services may apply. Please confirm with reception upon arrival. We offer a full service clinic for non-emergencies only. If you feel your medical needs are urgent, please call 911 or head directly to your closest emergency department. Please note that narcotic prescriptions are not available at the downtown walk-in clinic. See below for our up-to-date walk-in clinic, wart clinic, and blood collection schedules. *Please note that blood collection will still be available if there is no scheduled walk-in clinic but the wart clinic will be cancelled as a physician is required for consultation. If you do not have a valid health card, are a Quebec resident, or an international patient, fees apply. Call 902-367-4444 for further inquires. Please check the online blood collection calendar here, or call our up to date phone line at (902) 367-4444(902) 367-4444 to verify clinics are running as scheduled. PLEASE NOTE: If your blood work has been ordered by a family physician or specialist practicing at a location other than the Boardwalk Professional Centre, a cost of $7.00 will apply. 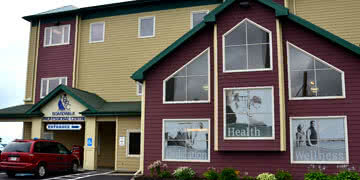 Alternatively the Queen Elizabeth Hospital offers blood collection free for all Islanders with a valid PEI Health Card. There is a cost of $15.00 per treatment (not per wart) for which you will be issued a receipt. Multiple treatments may be necessary. Please check our online wart clinic calendar here, or call our up to date phone line at (902) 367-4444(902) 367-4444 to verify clinics are running as usual. PLEASE NOTE: The Wart Clinic can only run when a physician is present. If the Walk-In Clinic is cancelled or finishes early we are required to close the Wart Clinic as well. Call (902) 367-4444(902) 367-4444 to book a drivers' medical exam. You must bring the required papers and a valid health card. The cost is $75 cash. If you have a family physician, you should attempt to have your driver's medical done through their office. To book an appointment with podiatrist Dr. Philip Somerfield please call toll free 1-866-865-8185. For inquires regarding what service is appropriate for you, please call (902) 367-4444(902) 367-4444 or visit with a physician.